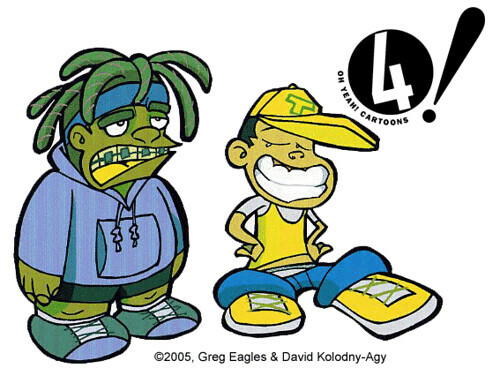 The Frederator Studios Blog: Greg Eagles & David (dahveed) Kolodny-Agy. Oh Yeah! Oh Yeah! Hiroshi Chida & Shuzo John Shiota. Greg Eagles & David (dahveed) Kolodny-Agy. Oh Yeah! Greg Eagles and David (dahveed) Kolodny-Agy came over to Frederator Studios to show us their unique cartoon Teapot, for possible production in the fourth season of Oh Yeah! Cartoons. Greg's a writer and voice over artist (we've worked together before on Buy One, Get One Free for What A Cartoon! Right now, Greg's famous for the voice of Grim on The Grim Adventures of Billy and Mandy). David's a storyboard artist who runs a company called Smorgasbord Productions. Thanks to Greg and David for kind permission to post models from their cartoon. Very interesting looking characters! Anxious to know more about one! We'll probably start announcing our pick-ups soon. Working on 'Teapot' with my very talented partner Greg Eagles has been a great experience for me. Before I forget, I wanted to give a shout out to everyone who helped out in the process. First, a big thanks to Linda Lee who was a huge help in cleaning up the boards and laying them out. Angelo di Nallo was also a big help- pulling an all-nighter to help me get the boards done. And a another big thanks to everyone at ASIFA and Women In Animation for their feedback and support during the process. Planning to pitch the 'Teapot' board one more time at the upcoming pitch night so anyone interested is welcome to join us. I heard about an abridge story of Teapot and I can't wait for this project to come.